This article is about the Booster Pack. For the card, see "Dark Illusion". The Dark Illusion is a Booster Pack in the Yu-Gi-Oh! Official Card Game (OCG) and Yu-Gi-Oh! Trading Card Game (TCG). It is the ninth set in the OCG's 9th series, following Shining Victories, and followed by Invasion: Vengeance. Includes cards used by Yuya Sakaki, Declan Akaba, Crow Hogan, Jack Atlas, Celina and Sora Perse. 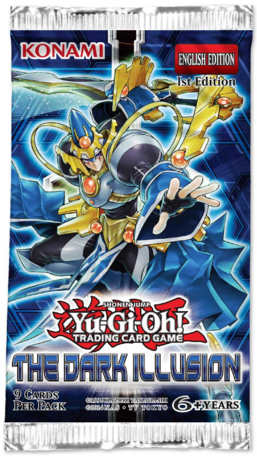 Includes members/support for the "Archfiend", "Blackwing", "Buster Blader", "D/D", "Dark Magician", "Destruction Sword", "Dinomist", "Dracoverlord", "Dracoslayer", "Frightfur", "Lunalight", "Magician", "Ninja", "Odd-Eyes", "Performapal", "Red Dragon Archfiend", "Resonator", "Shiranui", "Sphinx", and "Toon" archetypes. The TCG version includes members of the "Ninjitsu Art" and "Number" archetypes, as well as the "Railway" series. Introduces the "Metalfoes" and "Triamid" archetypes to the OCG/TCG. It also introduces the "Paleozoic" archetype and the first support for the "Aether" and "Empowered Warrior" archetypes to the TCG. The TCG version also introduces the "SPYRAL", "SPYRAL GEAR", "Subterror", and "Subterror Behemoth" archetypes. This page was last edited on 7 January 2019, at 00:21.